This is the story of one of the most fascinating kinds of modern communities — a great city hospital. Within these walls live doctors, young and old, nurses, technicians, and patients of all varieties. Their lives are tuned to the rhythm of birth and death, and to the countless intense dramas that lie between. Here is Dr. Bullard, who considered money a sin and refused to concede that a debutante could actually enjoy working in a hospital. Here is Jimmy Davenport, who fell in love with his floor nurse; here is the mysterious “Mrs. Smith” whose doctor had told her that the best place to hide is in the biggest hospital in the biggest city in the country. Here are diagnosticians, nurses interns, dietctians, clinical aids, and a host of patients. Deftly, sympathetically, and with sure knowledge, Miss Baldwin tells of the lives of the inhabitants of this strange modern kind of community. She tells of the nurse whose yearning for romance is stifled by requirements of duty; of the doctor whose ideals conflict with his needs; of the sick child, the millionaire intern, the too-pretty patient. 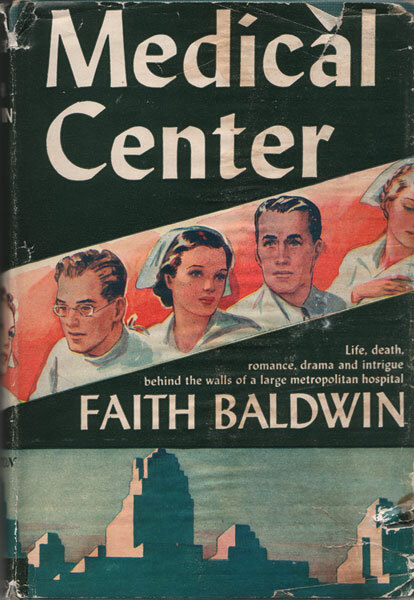 The fascinating world of a great metropolitan hospital comes alive in this many charactered novel.